–Where is the experience taking place? 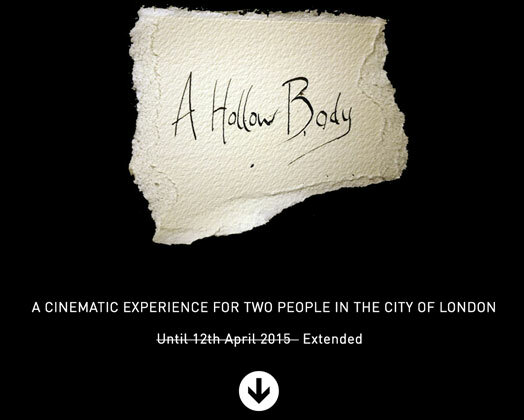 – A Hollow Body is an outdoor experience in the streets of the City of London. The experience lasts about 45 minutes so dress warm and grab an umbrella, just in case! –what if we get lost? The experience is divided into 3 chapters, if you get lost on one chapter you can use the ‘chapter index’ button to start or re-start any of the chapters. Each chapter begins with a map telling you where you need to be. As you and your partner will not always be together, you may want to choose a meeting point for afterwards in case you get lost. –is this an audio guide with factual information? No, this is an artistic work created as part of the Sherlock Holmes programme at the Museum of London. It is an evocative combination of a specially composed music score and a narration that lets you experience the city in new ways. –Is it a safe experience? During the experience you will cross over roads. The voice guiding you will invite you to stop and wait for the green signals. Don’t rush and act sensibly, as you would in any urban environment. –Is it suitable for children? – A Hollow Body was developed for an adult audience and involves crossing over roads, exploring streets and following a set of audio guidelines on your own. During the experience you and your companion will sometimes go on separate routes. The experience is therefore not recommended for unsupervised children under 14 years of age. –Is this walk accessible for wheelchair users? – We endeavour to make our experiences accessible but this route is in the public realm and includes steps and narrow alleyways. As such it is not fully accessible to wheelchair users. Please contact us for suggested alternative routes.